Ever wondered what it would be like to climb Mt. Everest? 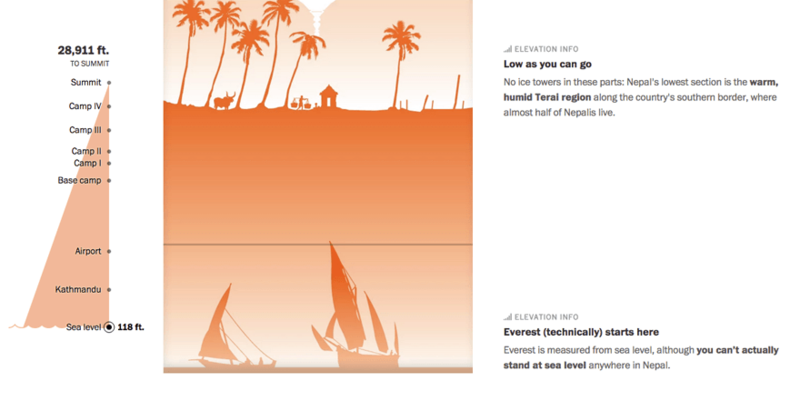 Now you can, thanks to a stunning new interactive infographic from The Washington Post. The interactive infographic, appropriately named “Scaling Everest,” aims to showcase what hundreds of climbers will experience along their journey as a compilation of images, facts, and sounds from the voices of the climbers themselves. Upon clicking the button, users are seamlessly transported to the end of the infographic and then can begin their own virtual climb up. Throughout the virtual climb, users can track their progress. Throughout their virtual climb, viewers are presented with a number of interesting facts, like this one: If you could stack 10 copies of the world’s tallest building (the Burj Khalifa skyscraper in the United Arab Emirates, at 2,716.5 feet), you’d still be more than three Washington Monuments short of Everest’s summit. Also unique is the addition of sound. A trio of explorers (Lydia Bradey, Pete Athans, and Suze Kelly) were interviewed, and snippets of their interviews can be heard throughout the “Scaling Everest” experience. This adds an important human element to the infographic. The climbers share their experiences, such as arriving in Tenzing-Hillary Airport, dubbed the world’s most dangerous airport for the ledge it is perched on. They also discuss parts of the climb, such as traversing the Khumbu Icefall—a steep, 2,000-foot portion of the glacier with towering waves of ice many stories tall. The end result isn’t just an infographic—it’s an experience. By embarking on a virtual climb from the bottom to the top, the viewer gets to experience Mt. Everest in a completely unique way. Supplemental stats, such as citing the height compared to the world’s tallest buildings like the Khalifa skyscraper, allow the viewer to visualize the sheer size and magnitude of the journey. The use of sound takes this interactive infographic to the next level. It’s one thing to read the words of an expert, but hearing their voices and learning from their first-hand experiences makes this infographic far more memorable. In contrast to a video, the use of the interactive infographic format allows the viewer to control their experience . From scrolling at their own pace to the clips they choose to listen to, the myriad choices allows the viewer to fully immerse themselves. To immerse yourself in Scaling Everest, click here.